So we are now well into the final stages of the League championship and the Castaways made another solid performance in out quest for promotion with a good team result against Tweedside with an outstanding team win but special mention must go to Liam Gilbertson with a brilliant 12+1 from six rides but with this fine victory come at a cost with our popular Pole Dominik Witoszek suffering a torn Knee cartilage to his left knee with will now keep him out for the rest of the season all of us at Canvey wish him a speedy recovery. So this left us a with a big hole to fill as i believe R/R will not be good enough to see us through till the end of the season and after a long chat to the rider and his promoter with have signed on loan till the end of the season Linus Cedergren from Newmarket he had been dropped from the team there and this is the ideal opportunity to put himself in the shop window for next season i think and hope he will do a good job for us here at Canvey he has had a behind the doors practice and has said the track is perfect and he is looking forward to the challenge ahead as the Castaways continue for the fight for the league and the KOC. Also would like to put on record and to thank Newmarket's Promoter Terry Rigby for the quick and prompt help in Signing Linus for the rest of the season. 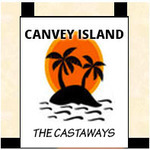 Steve Hayes Canvey Island Promotor .